Through the Mosquito Control Program, the City of Sugar Hill maintains its efforts to minimize the risk and prevent the spread of mosquito-borne illnesses and reduce human discomfort associated with large mosquito populations in the community. This initiative is accomplished by applying effective and environmentally sound mosquito control services throughout the City annually. For more information about Zika and other viruses spread by mosquitos, please visit the Georgia Department of Public Health website at http://dph.georgia.gov/ or the CDC website at http://www.cdc.gov/. While mosquitoes can never be completely eliminated, we strive to effectively control them by reducing population levels to more tolerable levels. Early in the mosquito season, the City of Sugar Hill dispenses larvicide tablets in areas of stagnant or standing water, which prevents new generations of mosquitoes from forming. In addition, we provide two community-wide sprayings to apply an environmentally safe, US EPA-registered insecticide. These proactive treatments will help to control and reduce the mosquito population through all stages of growth within the City limits. 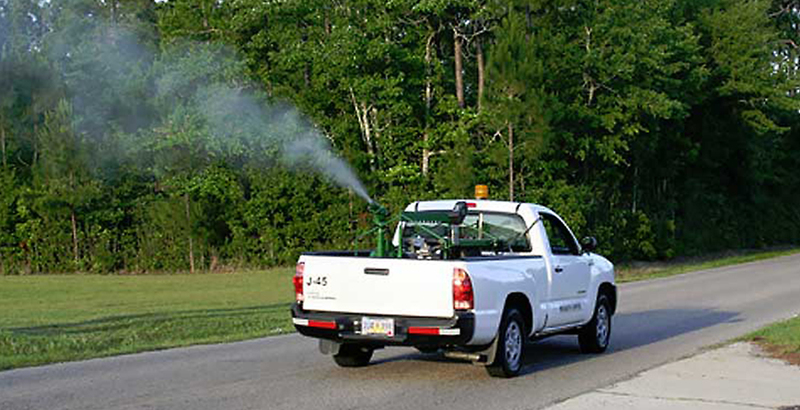 Shortly after midnight, a City vehicle will spray the insecticide “fog” as listed in the schedule below. The fog diminishes with sunlight and water. The mosquito spray will accomplish its work over night, and the next morning, when the sun rises, the chemicals are rendered harmless but the process of killing the mosquitoes has taken place. We have extended our spraying schedule to (2) rounds each year to increase the effectiveness of our Mosquito Control Program. It will take two weeks to spray the entire City for each application. Please see the spraying schedule below. This program will assist in controlling the mosquito population; however, it is very important that people continue to take precautions such as applying mosquito repellent to protect themselves. It is also very important that people ensure there are no stagnant pools of water on their property. Please visit the City website to learn more about our Mosquito Control Program and how you can help to prevent mosquitoes on your property. If you have any concerns, please contact the City of Sugar Hill at (770) 945-6716.